Does this count or not? Welcome to Day 2 of the Eat at Home Challenge — a one-week challenge designed to encourage and inspire you to make more meals at home in order to save money and eat more healthfully! 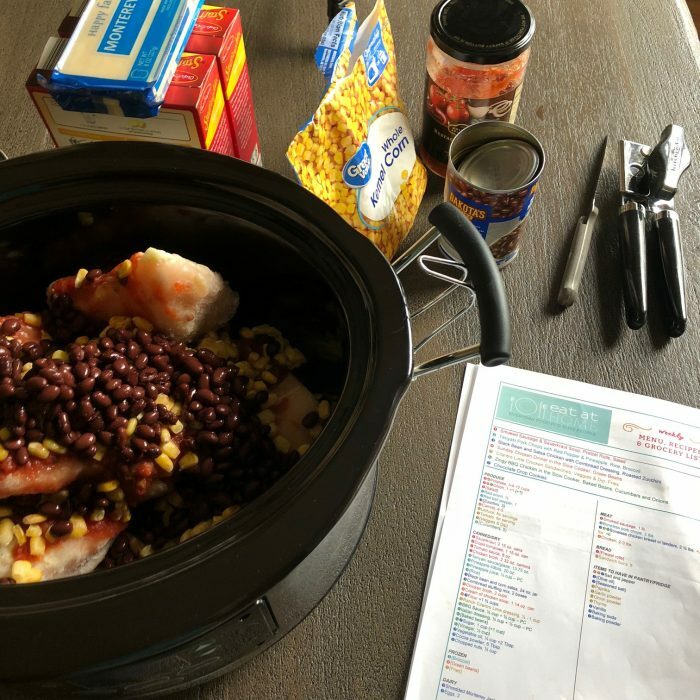 I’m following the Eat at Home Slow Cooker Menu Plan and just love it so much! You know how I said that I was going to do the Eat at Home Challenge this week? Well, I am doing it — you can watch my live videos on what I made for dinner the past two days here and here. But, we’re actually not eating at home tonight. I know, I sort of feel like a fraud! You see, we’re going camping with our Community Group and we’re all bringing food for a cookout for dinner at the campsite (I’m bringing beef hot dogs and brats for everyone — because I got them marked down or on great sales over the past two months and had them in my freezer!). I guess you could say that we are eating food from home at another location. So does that sort of count for the Eat at Home Challenge? 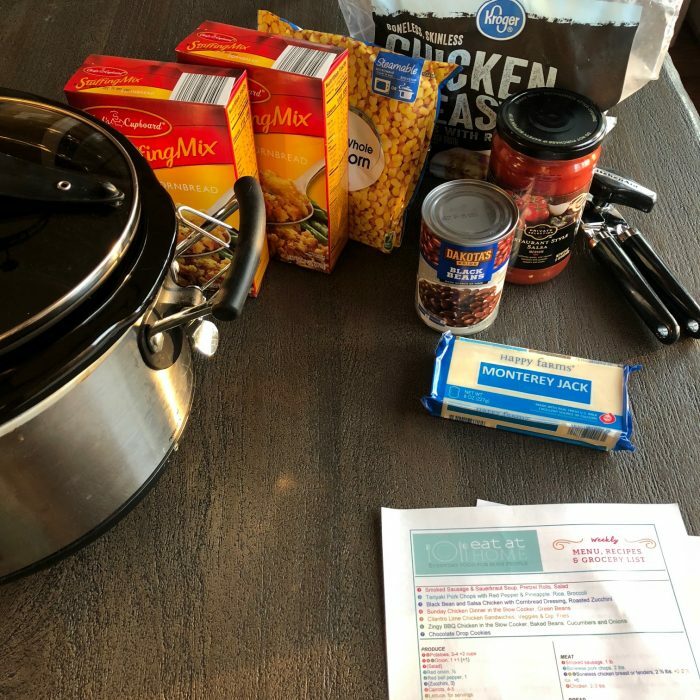 Even though we’re not eating at home tonight, I went ahead and made a slow cooker meal this morning so that we would have it on hand when we got home on Sunday from running the Tough Mudder. I’m going to take the liquid out and refrigerate all of it and then heat it up and make the cornbread dressing on Sunday when we get home from the Tough Mudder. It looks yummy! If you haven’t taken advantage of the amazing 30% off deal on the Eat at Home Menu Planning service, what are you waiting for? I cannot recommend this service highly enough. 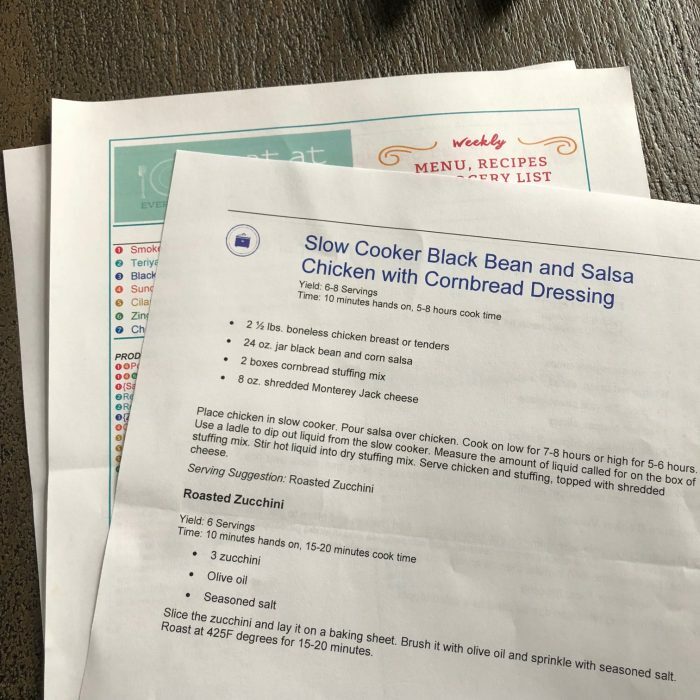 Not only do you get 4 different complete meal plans every single week (Slow Cooker — my favorite menu plan service, Traditional, No Flour/No Sugar, and Wholesome Traditional), but you also get a complete color-coded grocery list every week, too. 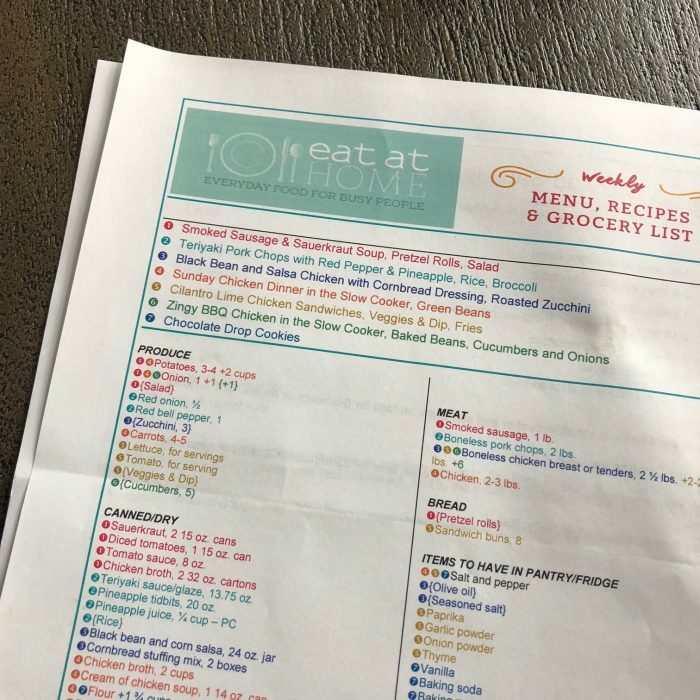 It saves so much time and money — and through next Wednesday, you can get a membership to the Eat at Home Menu Planning Service for as low as $1.13 per WEEK! That’s so incredibly inexpensive for the value that you get. 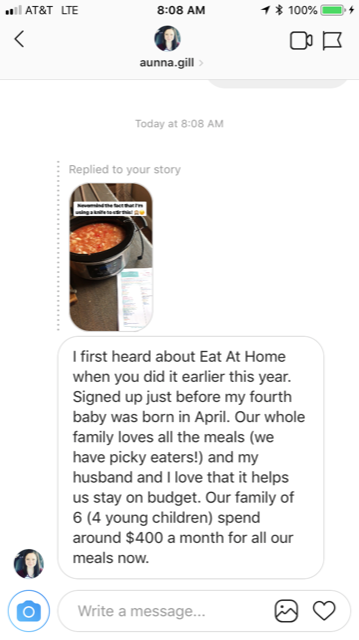 One of my followers sent me the above testimonial through Instagram about how much they love the Eat at Home Menu Plan Service. I wholeheartedly concur. And you can get 30% off your membership every single month when you sign up by September 19, 2018 and use coupon code FALL at checkout. Go here and use coupon code FALL to get in on this great deal. Are you doing anything fun this weekend? What are you cooking for dinner tonight? Leave a comment and let us know! Is there any where I can see samples of the meals besides the meals you’re sharing here? You might email them and ask them for samples. I’m guessing they can send you some! You’re either eating at home because you want to have family time or you are eating at home to eat home cooked food and not take out. I would say this fits either bill. That is a good point! Thanks for sharing! May I ask that you follow up with how each recipe works out and what you think of what you ate the night before. I’m always curious esp if it’s a new to you recipe. Please share with us! Thank you! Yes – I typically do this in my videos! The first night’s recipe was yummy, though Jesse thought it would be better with sweet potatoes… we haven’t tried this recipe yet. Well, I did sneak a few bites before we left for the camping trip and it tasted great! 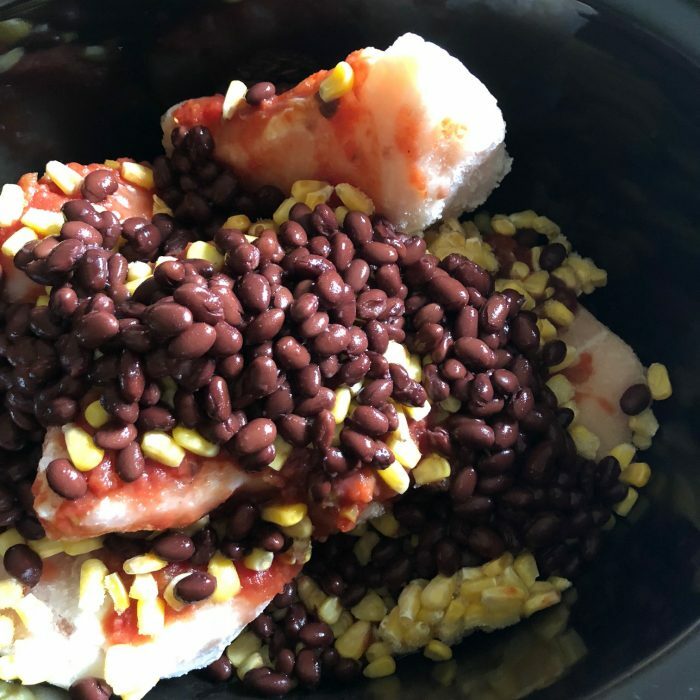 I thought you weren’t supposed to put frozen chicken in a crockpot. But it cooked okay? I have been doing this for years! It doesn’t cook as thoroughly for me from frozen if it isn’t cooked low for 8 hours though. I got sick of chicken sitting in my fridge then tossing it because I was afraid to eat it, so I started doing it from frozen. No issues, except once the thing that absorbs the blood was still attached to a breast of meat and it cooked with my soup…I sadly tossed that meal. Didn’t know what chemicals could have leeched onto our food. I also get chopped up stew meat and divide that up and freeze it with chopped sweet potatoes and toss it all in to make beef stew. I throw carrots in fresh because I have had trouble with frozen carrots in the crock. Just that and a packet of stew seasoning and water and you have a delicous beef stew. Do you feel like she diet friendly meals? I trying to lose weight. Do they give nutritional info? I used to use emeals. How does this compare? I’ve tried Emeals before and the food just wasn’t something that would work well for our family. What I LOVE about Eat at Home is that you get access to four completely different menu plans every single week — including No Flour, No Sugar meals. I think you could also tweak most of the recipes from the other menus to be more diet friendly/low calorie. I’m already a member of Eat at Home but I’m not seeing this recipe for this week. Maybe I’m crazy?? Can you tell me which week/plan you got this recipe from? This was actually from a November menu plan I hadn’t used yet! Oh well that explains it 🙂 Thank you! !